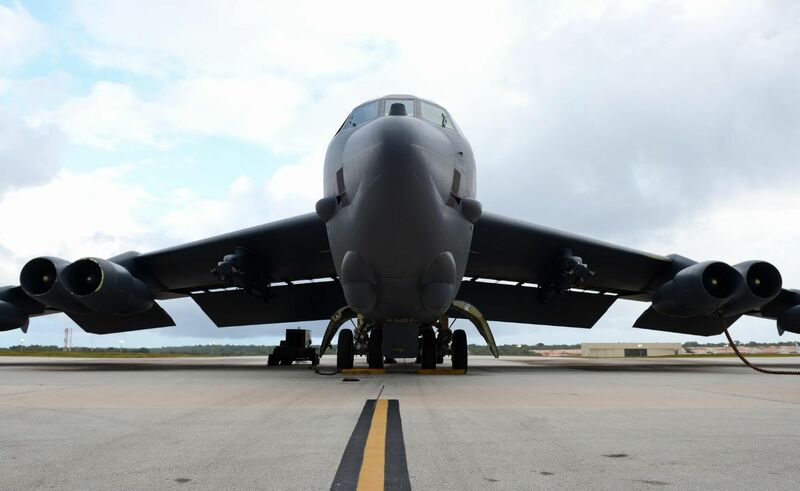 The U.S. Air Force said Thursday it sent two B-52 bombers over the East China Sea for training with the U.S. Navy and Air Self-Defense Force near Okinawa Prefecture, the latest mission in the waterway that is home to the Japanese-controlled Senkaku Islands. 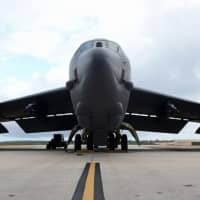 The training mission, which took place Wednesday, was part of the so-called continuous bomber presence operations the U.S. military says have been ongoing since March 2004 and are part of the United States’ long-standing “freedom of navigation” policies. “Two B-52H Stratofortress bombers took off from Andersen Air Force Base, Guam, and conducted integration training with the U.S. Navy, Koku Jieitai (Japanese Air Self-Defense Force) and F-15C Eagles assigned to the 18th Wing, Kadena Air Base, Japan, in the vicinity of the East China Sea,” the U.S. Pacific Air Forces said in a statement. The U.S. and Japanese militaries regularly conduct such exercises in the East China Sea. Beijing — which also claims the Senkakus and calls them Diaoyu — in response often dispatches ships and aircraft to the area surrounding the tiny islets. In November 2013, China declared an air defense identification zone, in which aircraft are supposed to identify themselves to Chinese authorities, in the East China Sea. The United States and Japan have refused to recognize the ADIZ, and many observers have viewed it as an attempt by China to bolster its claims over disputed territories, like the uninhabited Senkakus. Beijing said in 2017 that Washington should respect the ADIZ after Chinese officials warned a U.S. bomber that it was illegally flying inside the East China Sea zone. The Pentagon rejected the Chinese call and said it would continue its flight operations in the region. The United States is obligated to defend aggression against territories under Japanese administration under Article 5 of the U.S.-Japan Treaty of Mutual Cooperation and Security, and top U.S. officials have said this extends to the Senkakus. Training missions such as Wednesday’s have apparently ramped up amid protracted military and trade tensions between Washington and Beijing, with one mission on March 4 and another in January taking bombers over the East China Sea. China’s Foreign Ministry has said no military ship or aircraft could scare Beijing away from its resolve to protect what it says is its territory. China has built up a series of military outposts in the strategic waterway, which includes vital sea lanes through which about $3 trillion in global trade passes each year. Washington and Beijing have frequently jousted over the militarization of the South China Sea, where China, Taiwan, Vietnam, Malaysia, Brunei and the Philippines all have competing claims. The U.S. does not maintain any claims there, but says the operations are conducted globally with the aim of promoting freedom of navigation.